Sometimes it's useful to be able to add lots of extra information behind a single item in your Coggle diagram. 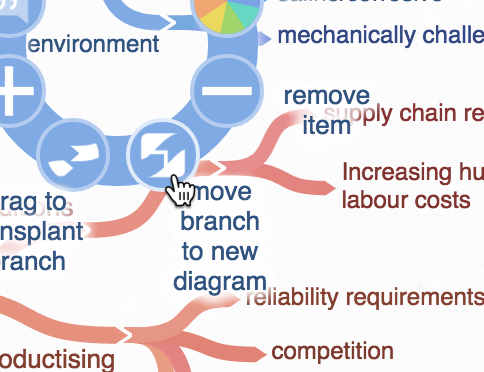 Right click on the item who's branches you want to link to a new diagram. Hold down the [shift] key: the copy icon in the menu will turn into an option to "copy branch to a new diagram". Click the "copy branch to a new diagram" icon. The branch and its child items will be copied into a new diagram. The branch selected is automatically converted into a link to the new diagram which you can click to open it. The title of the new diagram is also a link back to the original. Alternatively, if you want to move the branch and all its existing child items to the new diagram, instead of copying them, hold either the [ctrl] or [alt] keys after opening the menu.